Laminate countertops are the most inexpensive option in comparing to other types of countertops. They are available in verities of colors and definitely the best choice when you are on the budget and not ready to spend thousands on a new counter. Homeowners, who are planning, or have this type of countertop, should know it properties, in order to avoid damaging and as a result undesirebale replacement. The most common finishes are: mate, crystal, and gloss. Different manufacturers offer their own colors and textures. 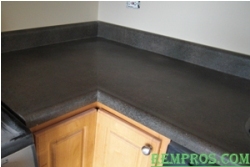 Laminate countertop is a synthetic product that has a few layers of different materials glued together. Top finishing part is actually what we see, it is made from plastic or combinations of plastic and some other materials. This layer based on its structure non-porous and nothing can penetrate the surface of countertop that make its stain resistant. On the other hand, it can be easily damaged by heat or be scratched with knife. During cleaning sharp instruments should not be used. Base is usually plywood or MDF (medium-density fibreboard). If the top layer of a countertop will be damaged and water can penetrate to the substrate, it might cost a big problem. Countertop will swell; the edges will separate and loose its appearance. It is not recommend installing any types of under mounted sinks because it will increase a possibility of water damage. It is very hard or, lets say, nearly impossible to repair severely damaged countertop unless the whole top layer will be replaced. Very light damages can be hide by using a repair kit from any home improvement store. There is another alternative to repaint not well looking countertop, but it will not hide any damages – just make it looks fresh. Basically there are two types of laminate countertops – prefabricated and custom made. Prefabricated is easy to buy in any home improvement store or online with a laminate finish already applied. All you have to do is cut it by sizes; connect cutting pieces to the base cabinets and to each other. Custom countertops are made to exact dimensions of kitchen. There is another type of countertop made at a job site. It is possible to do it yourself, but you have to have big experience and operating hand tools because all cuttings, applying laminate finish and edges suppose to be done nice and sharp for the best visual appearance. Cost of laminate countertop to get installed will depend on a type of a counter, finish, and who will perform the installation. Improved technology allows making seams almost invisible and sometimes even hard to find. Major manufacturers now offer much better products and laminate countertops coming back in their popularity.